Before launching my career as a childrens book illustrator I worked as a 3d animation artist on wonderful projects focused on the childrens entertainment market. I was lucky enough to contribute to wonderful short movies like “Angel Afoot”, “The Gruffalo” or “The Princess Painting”. With the start of 2011 I finally went after being an illustrator full time. 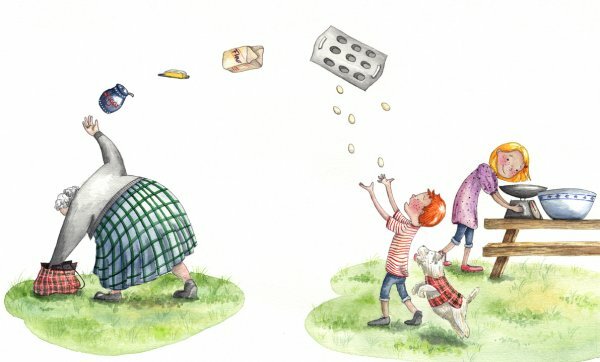 My first two books “Getting Dressed”, published by HarperCollins educational series BIG Cat, and “Wee Grannys Magic Bag”, published by Picture Kelpies an imprint of Floris Books, will be released this September. Each of the books was illsutrated in a different style as I am working in digital as well as traditional mediums. When working traditionally I mostly use watercolour and sometimes a little ink. Being able to offer two unique styles has helped a lot in providing clients with the illustration style they were looking for, as not every publisher is interested in digitally created art and some do prefer it. It also is wonderful being able to switch between the two mediums and keeps the creativity more alive for me to speak. At the moment I am again working on two books and as with the ones before, each is done in a different medium. Both books will be released in Germany early 2012, so until then I can not tell much about them. Only this much, that one is even written by myself, which is very exciting for me. When a new book lands on my desk I start working on it whether it will be digital or traditional just the same way. The beginning is always a storyboard. Plotting down the story and seeing things work together is really helpful. When the storyboard is approved by my client I go on to making the roughs in the original size of the later to be printed book. Having made the storyboard makes it much easier and even faster to go though this stage of creating the art for a book. Also the previously created storyboard prevents making roughs that are not at all what the client was looking for. The roughs help to find the right composition and page layout. It is also the stage at which I tighten up the characters and their poses, to ensure the story, which is supposed to be told, is comming across nicely.